Given that there have been considerable advances in the treatment and management of oncologic diseases in children, the fifth edition of this successful clinical manual will be entirely updated to incorporate all current protocols and developments.This edition will be a comprehensive book on patient management, replete with algorithms and flow diagrams on diagnosis and management. Its concise and easy-to-read format will enable readers to make accurate diagnoses and permit them to treat patients without having extensive previous hematologic/oncologic experience. A list of normal values at various ages in children, providing an extremely useful reference for patient management is included. "This text is a very good intermediate level book focusing on the clinical presentation, diagnosis, and management of both hematologic and oncologic disorders observed in children. The combination of text, tables, and outlined material makes the information easy to access. It provides a handy text for pediatricians caring for both hematologic and oncologic problems. It also is particularly suitable for pediatric students and residents. The comprehensive tables of normal values in infants and children at the end of the text are very useful." "This Manual is an amazing amalgam of an extremely practical workbook and also more than a bird's eye-view of the entire scope of pediatric hematology-oncology. In my opinion, this Manual is a "must-have" book for three distinct and important potential users: clinicians in practice, residents and fellows in training, and medical students. Dr. Philip Lanzkowsky deserves congratulations for this authoritative and yet highly accessible text." "The Fifth Edition of the Manual of Pediatric Hematology and Oncology constitutes an evolutionary leap from previous editions. 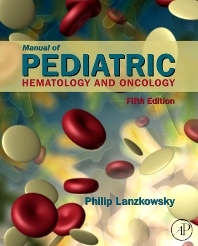 In addition to an instructive manual containing the body of information required as background for the numerous informative and clearly organized tables, algorithms and instructions, the present extensive and thoughtfully produced book is also a source of scientific and clinical learning on the broad spectrum of subjects that make up pediatric hematology and oncology – in this era of rapid, and often bewildering, developments. The style is clear and authoritative, attesting to what the editor's colleagues and disciples call "the Lanzkowsky way of teaching." The contributors are internationally known experts in their various subjects, and the material is admirably up to date. This edition is of great value not only to pediatric teams of hematologists and oncologists, but also to pediatric practitioners in general." "I would not be without this book and have been recommending it to postgraduate students in paediatrics and paediatric haematology and oncology for a number of years. It is packed with up-to-date, concise and practical information. The detailed tables and algorithms are extremely useful both as teaching and management tools. I was particularly impressed with the expanded information on haemaglobinopathies and haematologic manifestations of infectious diseases in this 5th edition. This book should be on the shelves of all paediatricians and paediatric haematologists."